Sometimes you need to use a stand for your 360-degree camera. A selfie-stick with tripod legs is portable and convenient, but usually not very tall/long. A regular camera tripod is taller but shows up prominently in the shot because of the larger panhead. For greater height and stability, consider using a light stand. In this post, I will show some of the benefits of using a light stand for your 360-degree camera. I’ll also help you select a light stand. Hit the jump! Here is a selfie stick tripod compared with a light stand. The selfie stick I use is the iKross, which can extend to 40 inches. The compact light stand I like to use with the Ricoh Theta is the Manfrotto Nano / 5001B, which has 5 sections and can extend up to 74 inches. Now here is the same scene, this time with the compact light stand. As you can see, there’s a significant difference between the two images. It doesn’t mean the light stand will always be better, but if you need the height, the light stand will be the superior tool. A light stand’s legs form a wider base than the legs of a selfie-stick tripod, and the light stand’s legs are often adjustable. For example, with the Nano, I can adjust it from a narrow base to a very wide base, depending on the conditions, such as wind. Not only can this stability help you avoid damaging your camera from a fall, but it can result in sharper shots, especially when you’re taking HDRs. A selfie-stick is usually made for portability, so the shaft is not very strong, and has some flex to it. This can affect the sharpness of the shot when you’re using shorter shutter speeds. A light stand is made to hold strobes, which can be heavy, so light stands tend to be fairly rigid, even when extended. WHICH KIND OF LIGHT STAND? Most 360 cameras for consumers are small and light, so I don’t feel the need to get a heavy duty light stand. Instead, I like using a compact light stand. The Manfrotto Nano / 5001B can extend up to 74 inches, but folds down to 20 inches, which for me is reasonably portable. It’s also made of aluminum so it’s fairly light. There are cheaper compact light stands, but I’ve had one before but one of the knobs broke, so the next time I got a compact stand, I chose the Manfrotto Nano. There’s a newer model called the Nanopole which has a detachable base and extendable legs. If your priority is maximum height, and portability is not an issue, you can use a taller light stand. I like the Linco 8310 10-foot stand, which is very well made yet affordable. It’s very tall and is made of steel, but is not too heavy at around 5.5 lbs. When collapsed, it’s around 3 feet 3 inches (99cm) long and not much longer than their 8-foot stand (2 feet 9 inches when collapsed). A selfie-stick tripod is useful but has its limitations as to height and stability. 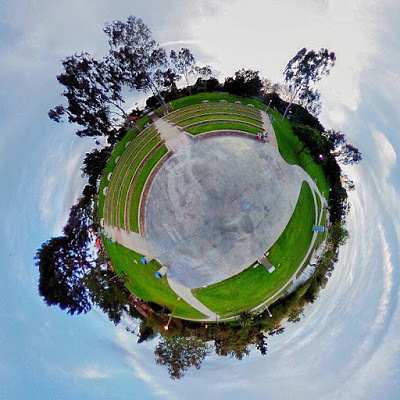 For some projects, you may want to use a light stand instead for your 360-degree camera. If you found this article helpful, you can support this site by using the links above to purchase the items from Amazon. I’ll earn a tiny commission at no cost to you. Great suggestion – made especially so since I already own both the Manfrotto 5001B and Manfrotto Nanopole. The latter offers superior versatility in that the pole extension separates from the tripod, e.g. 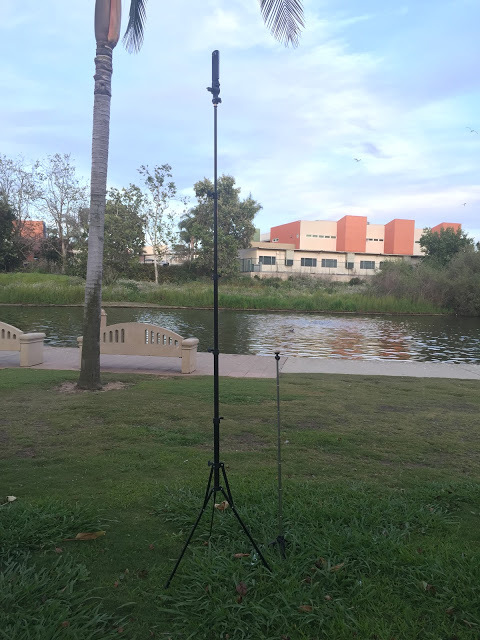 for use as a mic pole (now a keymission 360 pole). With the Theta S or SC mounted onto a stand with tripod, is there any model or stand in the market that can completely "hide" from the photo shot?